On the other hand, if you don’t need an ECHO, and you are determined to start a new Project FI service, then ignore our previous Moto X + ECHO offer, and instead take advantage of a new limited time promotion at Google’s Project FI that gets you the new condition Motorola Moto X4 in the “Android One” version for $250 but that’s not all. You also get an $80 Project FI service credit if you make a purchase and activate the phone by March 17 in 2018. 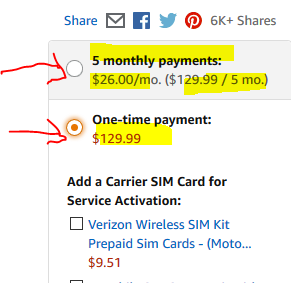 The $80 service credit is only good for NEW FI customers. This is a pretty good deal, since ProjectFI only charges you data “by the pound”. So you are essentially getting the phone for $170, assuming you will like the Project-FI service and stay with them long enough for the promotional credits to be applied to your account. Regardless, the Moto X4 is an “all carrier” phone so you can use it with other carriers in the future. I am currently using Project FI with a Nexus 6 [yes, I am on the cutting edge!] and to setup a second Data-SIM only phone as an actual backup to the line. More on that in future blog-posts. If you happen to want an unlocked smartphone that will work with all major US carriers, and you also want a second generation Amazon ECHO device, and you are a Prime member, $350 will get you the aforementioned ECHO device along with the new condition Motorola Moto X4 smartphone from Amazon actual. This is an unlocked smartphone with a USA warranty, and it will work all four major US carriers, and also Google’s Project-FI, currently the only non-Google phone that is compatible with the service. This is a limited time offer, but they don’t mention when it expires. PS: speaking of unlocked smartphones, I just posted an unboxing of the Sony Xperia L2, with more posts and review action coming up in the next few days. If you need a smartphone right now that will work on all four major US carriers, and don’t want to wait to see what the Fall of 2017 will bring us, and want to stay under $300, there is a pretty good deal right now on the fifth generation Motorola Moto G Plus, in the more advanced 4GB RAM and 64GB storage option, in the Lunar color scheme, going for $250. This is factory unlocked, with a USA warranty, and it is sold and shipped by Amazon actual. This is the standard version of the phone, NOT the Prime ad-subsidized model with Lockscreen offers. So, other things equal, this phone has the best resale value. 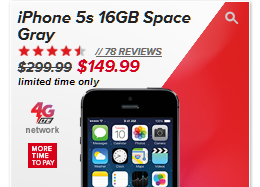 It is unlocked, a USA model, and works with all four major carriers. Yes, even the CDMA duo of Sprint and Verizon. This is partially thanks to the Snapdragon 625, a chipset that is getting quite a lot of good reviews in bang for the buck phones. But wait, there’s more! The Amazon website may also offer you an option to purchase it with a five installment plan. There is no interest, and no credit check. 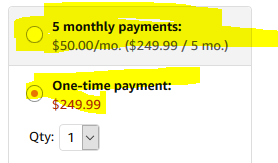 The Amazon computers predetermine eligibility for these type of offers based on a customer’s Amazon account history and status and offer them automatically. They will simply charge your credit cards $50 for five consecutive months. 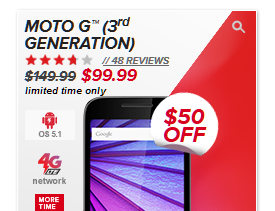 In addition to the previously mentioned LG Stylo 2 sale, the official Virgin Mobile USA online store also has a sale on the new condition Motorola Moto G (3rd generation) for $50 with free shipping. That’s it, you own it! You don’t even have to start service with it, but it will pester you to activate when you reboot it. There are ways to make this less painful [see our post for the LG Stylo 2]. Note also that this is the entry-level of the third-generation Moto G models. Unlike most other smartphones, the entry-level model has half the RAM and half the on-board storage from the more advanced models. So with this one you get 1GB RAM and 8GB on-board storage. I haven’t used this smartphone, but I have the first generation Moto G, and it’s holding up rather well considering it was a $20 phone when I bought way back then. This is a nice deal, especially if you have available Virgin Mobile balance to pay for it, the third generation of the Motorola Moto G is on sale for $85 with free shipping, in new condition, without contract requirements, at Virgin Mobile. Please note however that this is the lower end model with 1GB RAM and 8GB on-board storage, so if you are reading reviews, make sure you pay attention to the distinctions. 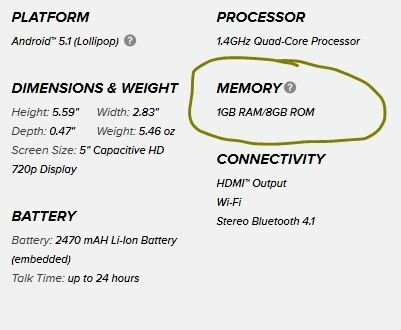 Motorola makes a 2GB RAM with 16GB on-board storage model, unfortunately that’s not available at Virgin Mobile. Note that these are locked to Virgin Mobile which runs on the Sprint network, so if you are fond of the more open GSM systems, these won’t work there. You may or may not be able to run them on other Sprint systems, check the various Android phones to see what else you can do with them. Do not assume they will work anywhere else unless you find out for sure. But if you don’t want to use the cellular part, these definitely make good budget Wifi-only device for lightweight use at the home, eg a remote control of different media and internet of things products. After the holidays ended, the prices jumped up at Virgin Mobile, but of course in the fast-paced world of smartphones, that wouldn’t last long. And indeed, there is a new sale now, headlined by the iPhone 5S (16GB) going for $150, and the 3rd-generation Motorola Moto G for $100. This is the latest model, however, this is the entry-level model with 1GB RAM and 8GB on-board storage. There’s also a model with 2GB RAM and 16GB on-board but unfortunately Virgin Mobile does not carry that one. Also on sale is the Huawei Union for $30, while Windows Phone fans have their Lumia 635 down to $50 (it had gone as low as $40 at some point in the year). These are no-contract phones, you own them, however, they are locked to the Virgin Mobile network, which is part of the Sprint 4G LTE infrastructure. Check the various phone forums to see which one of these phones can be hacked away to work on other Sprint MVNOs. If you have the first generation Motorola Moto G smartphone, and love turquoise type of color shells, you are in luck! The official Motorola shell, only in the turquoise shell is now down to $3.19 with a limit of three per customer at Amazon.com, where it averages 3.9 out of 5 based on 400+ customer reviews. Now the bad news. This is an “Add-In Item”, so you must place an order of $25+, otherwise the shopping cart will not let you buy it. This restriction includes Prime members. One easy way to get to $25+ is to pick up some microSD cards for your other phones/tablets/devices, for example, this 64GB Kingston goes for $19 (and in frustration-free packaging), while this 64GB Silicon Power goes for $20. NOTE: the first generation Motorola Moto G does NOT take microSD cards. But most households have multiple mobile devices, so chances are you can use microSD cards – that’s why I’m mentioning them. This is a good news / bad news type of a thing. The good news is that the third generation (latest model as of writing time) Motorola Moto G has arrived at Virgin Mobile USA and it is available for purchase for $150. The seller is offering a 30-day money-back guarantee but obviously no warranty.